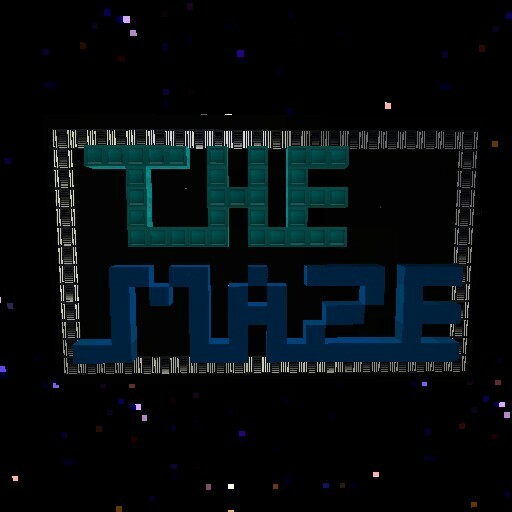 Go to http://store.steampowered.com/app/342480/ or type “Gunscape” in the search bar. 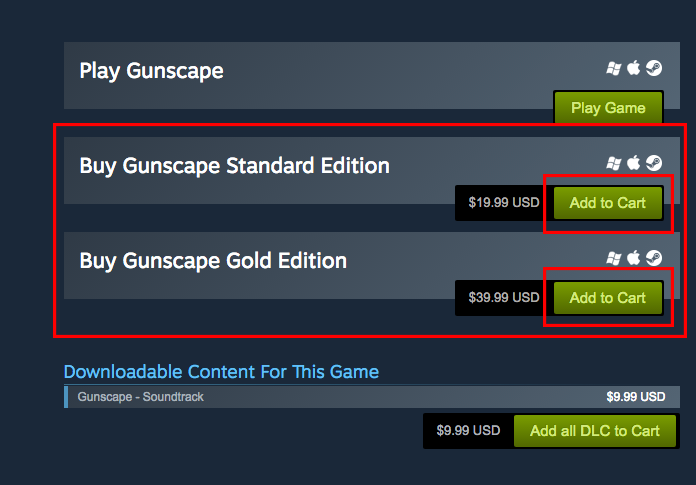 Depending on the version you want, go to “Buy Gunscape Standard Edition” ($19.99) or “Buy Gunscape Gold Edition” ($39.99), and click on “Add to Cart”. When you’re in your cart, you will get two options: “Purchase for myself” and “Purchase as a gift”. To gift the game to someone else, click on “Purchase as a gift”. 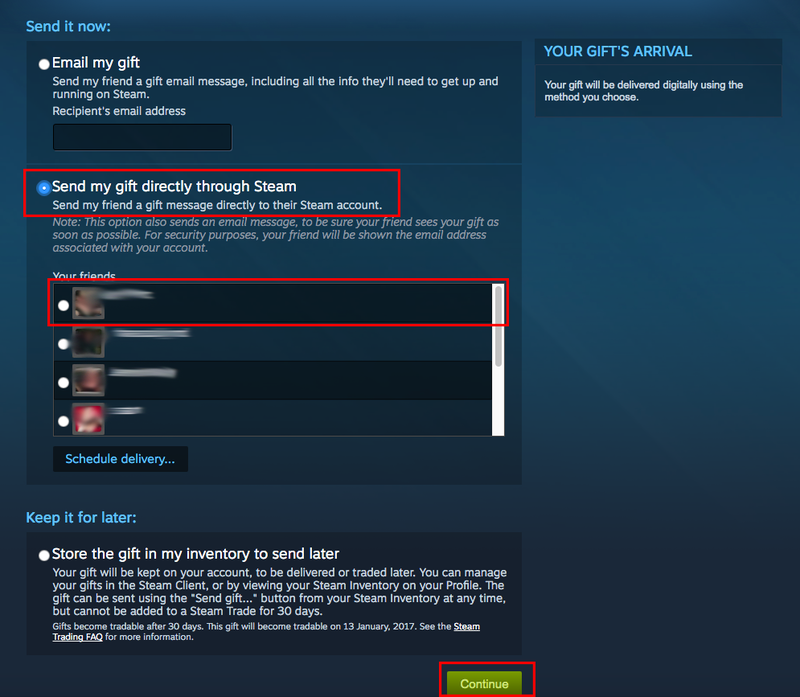 You will be taken to the following screen, where you have three ways of gifting the game: Through email, through Steam, and sending the game later. “Email my gift”: If you want to give it through email, you have to select “Email my gift”, type the recipient’s email and then click on “Continue”. You can also schedule the delivery, so if you’re buying it before Christmas, but want it to be sent on Christmas day, then you can click on “Schedule delivery” and set the date and time. 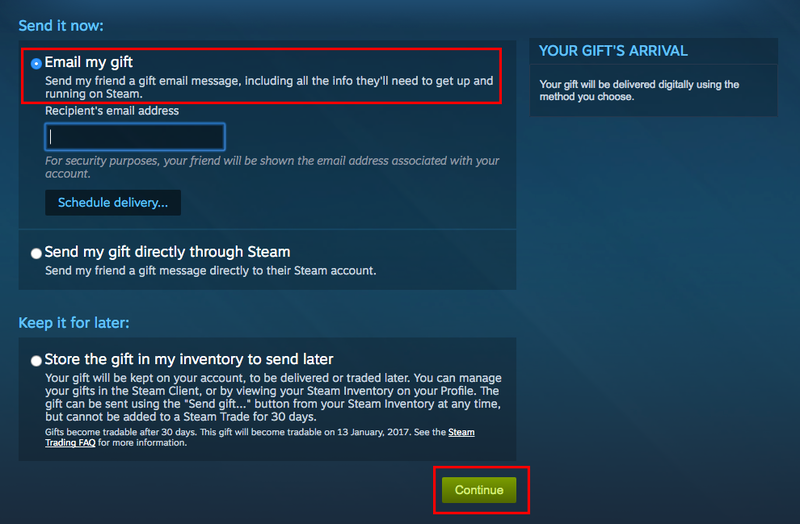 “Send my gift directly through Steam”: If you want to send it through Steam, then you select “Send my gift directly through Steam”, and select the recipient’s Steam account (you have to be friends with them). You can also schedule the delivery in this option, and you just need to click on “Schedule delivery” to do so. 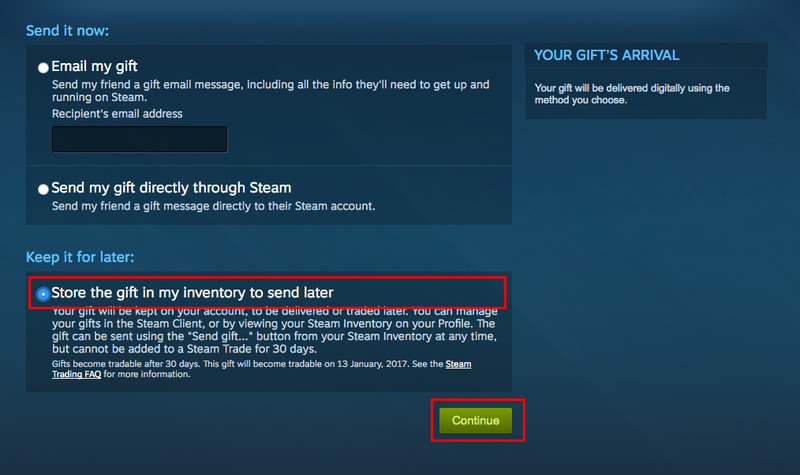 “Store the gift in my inventory to send later”: If you want to keep the game in your inventory so you can gift it later, you can select “Store the gift in my inventory to send later” and then click on “Continue”. The game will appear on your inventory, and you can click on the “Send game” button on your Steam inventory whenever you want. 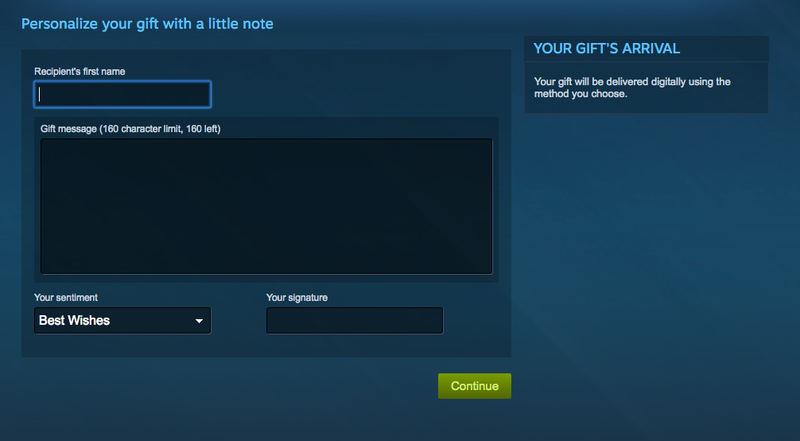 If you picked to send it through email or through Steam, you can add a Gift Note that includes “Recipient’s first name”, “gift message” (160 characters), selection of “sentiment” (best wishes, your turn, etc. ), and “your signature”. Then click on “Continue”. Then you have to select your “Payment method” between a few options like Paypal, credit card, bitcoin, etc. Select the one you prefer, fill your details and click on “Continue”. The recipient, then, will receive a notification (or email) about getting the game. Once they receive this, the game will be attached to their account (or email). Buy a Steam Gift Card. You can get them at EB Games, Coles, Woolworths, etc in Australia or your local retailer in other parts of the world. (Just be careful, cards are in USD and if it’s a “$50” card, it might cost you more than that due to currency conversion). Scratch the gray security bar on the back of the card to show the 15-digit code. Log into your Steam account (or make one if you don't have one) and go to "Redeem a Steam Gift Card or Wallet Code". 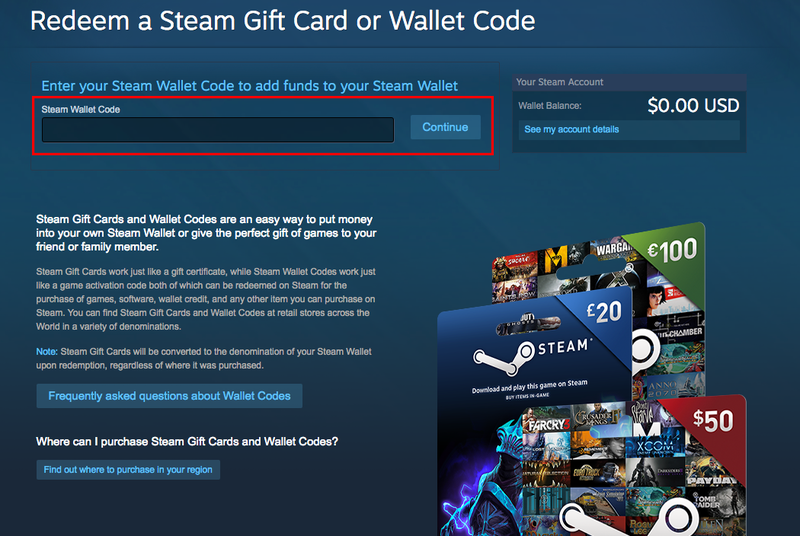 Enter your code into the “Steam Wallet Code” field and then click “Continue”. Now you will have the amount of denomination of the gift card added to your “Steam Wallet”, which you can see in the upper right corner of Steam. 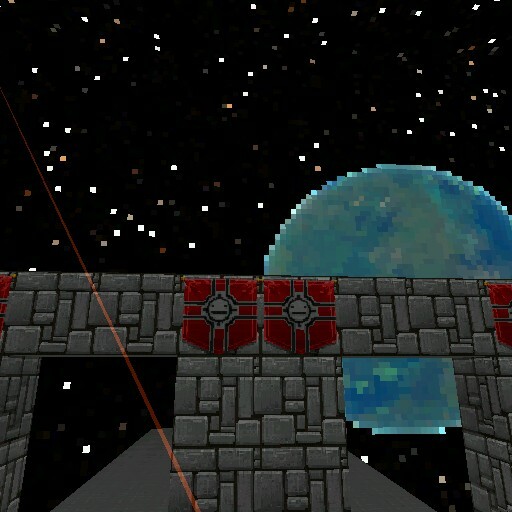 To get Gunscape, go to: http://store.steampowered.com/app/342480/ or type “Gunscape” in the search bar. When you’re in your cart, you will get two options: “Purchase for myself” and “Purchase as a gift”. 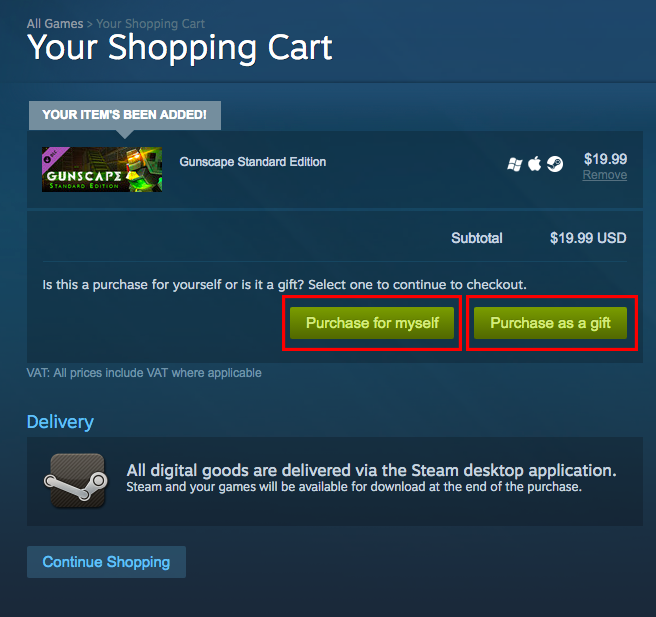 If you’re using the giftee’s account, then click on “purchase for myself”, but if you’re adding the credit to your account, to then gift the game to someone else, then click on “Purchase as a gift”. In both cases, you need to follow the steps mentioned above in “Payment method”. Only 10 more days until the ho-ho-holidays! We might skip the week after Christmas, but don’t worry! We’ll come back with a special edition with lots of maps. Anyone planning a christmas or holidays themed map? We’d love to feature those! Defeat the nazis… in space! Nazi maps are a classic, and this is one of them. 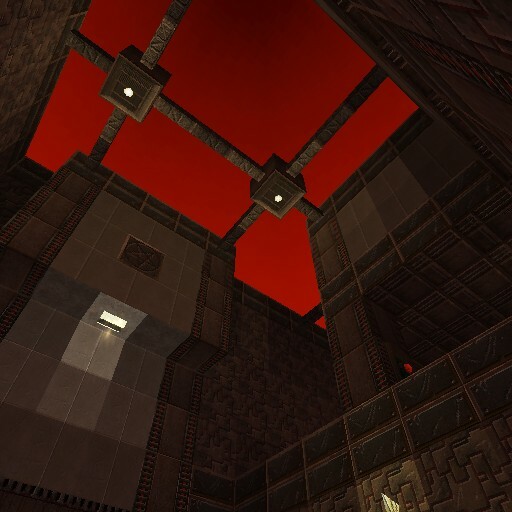 If you want a sort of short but challenging map, this is the one for you. 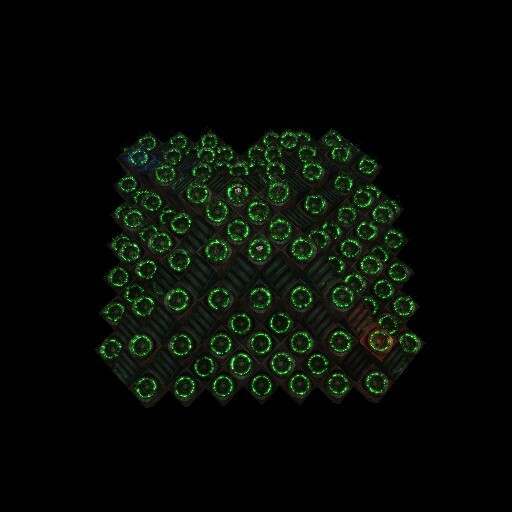 You get quite a few enemies and enough weapons and ammo, but only a bit of health so you might end up dying a few times! The progression and design is also quite good, as you’ll feel that each room is harder than the previous one. A map for all of your futuristic-themed map needs! This map is a bit like a cage, it’s basically a cube and it’s quite small, so if you want a map for small teams, this is perfect, but we’re sure it’d work for larger groups as well. You also only get one type of weapon, but it’s a gauss gun, so you’ll get a lot of 1HKO’s (and die a lot). This one is an easy one to describe… but not to beat. It’s basically two rooms, one of them with a lot of weapons, ammo, health and armor, and the other one… you guessed it, right? Just a lot of monsters! 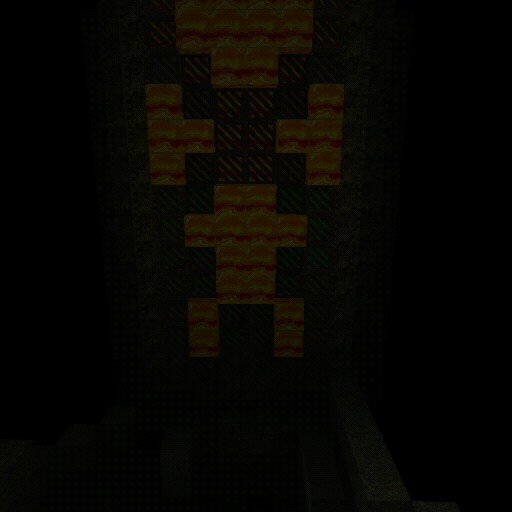 Destroy everything in sight and you’ll be okay, fall into the pit of monsters and well… you probably won’t survive. Aussie developer here. This is how the Australian outback is, can confirm. Seriously, though, this is a really good map! It combines different themes, as it has quite a few aliens, but they’re all in a sort of forest and desert-like area. You’ll only get a couple of weapons too, so at some points it can be quite challenging (we died a few times), but that’s what makes it fun, right? A simple map for all of your Team needs! 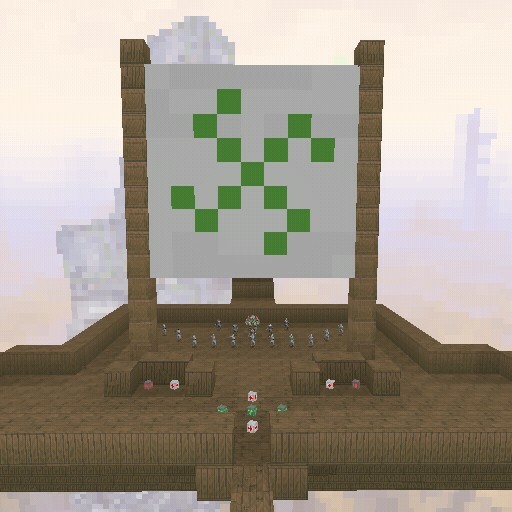 This one works especially well for capture the flag, too ;) The map is pretty straightforward, but that’s usually a good kind of map for battles! You’ll have plenty of space to fight your opponents and to plan your own team’s strategy. Make sure to grab the weapons that you’re offered too! You’ll probably need them. This is a quite cool co-op map! If you like to fight nazis and mechas, this is the map for you! 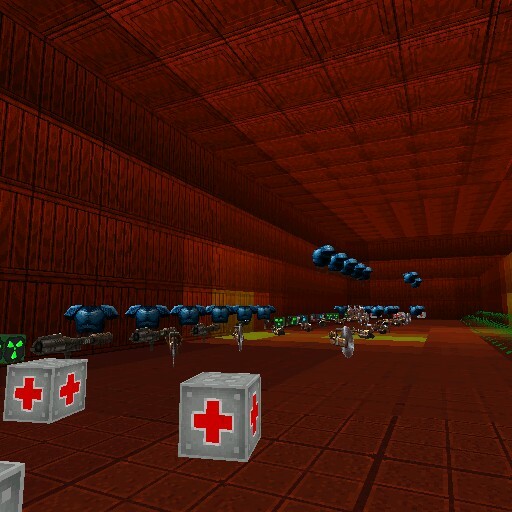 It gives you enough weapons, ammo and health, but also quite a few of enemies, which makes it a balanced map. The design is also pretty cool, and the map will take you just the right amount of time, it’s not too short or too long. So this week we have quite a few (6!) maps listed. We’re always happy when we find so many good maps! 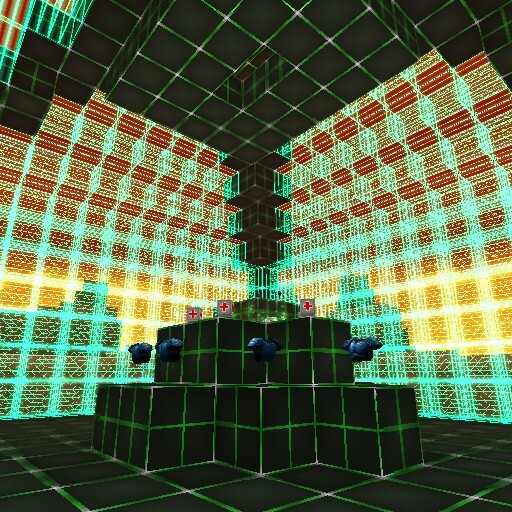 If you’re looking for a challenging map with a futuristic theme, this is the one for you! 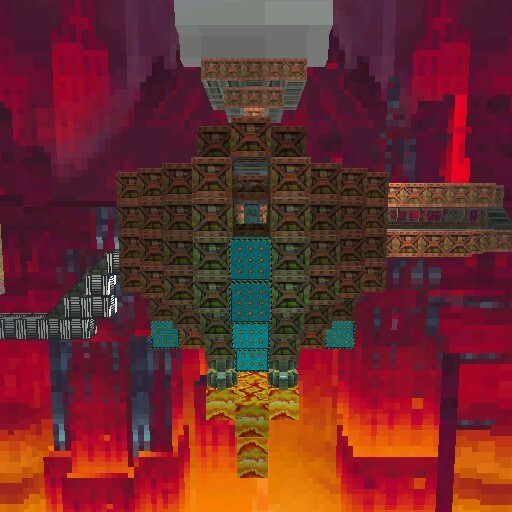 In this map, you’ll only get a few weapons (but plenty of ammo) to confront a series of difficult monsters. You’ll even begin with a boss! 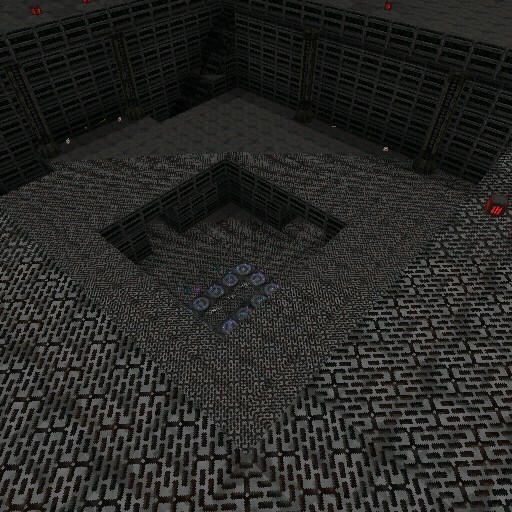 The design of this map is pretty cool as well, and you might even have to survive some traps to progress. This map is specifically made for team matches, so grab your friends and try it! This is also a sort of space-themed map, and the design is quite interesting. You’ll begin with a couple of basic weapons, but if you explore the map, you’ll find a few good ones! The good thing is that the map isn’t quite big itself, so it works for small groups as well as big ones, but you will still get about 3 “levels” where you can fight against others. As the title says, this map can be quiiite annoying, but we guess that’s what makes it special. The map is basically a few platforms and a lot of jukeboxes… like… a lot. So you will get the music the whooole time. What can be more annoying, though, is finding your way through the map, as the areas are quite similar, which means that you might end up going backwards instead of progressing (which totally didn’t happen to us… no…). This is the first part of a campaign and it’s quite good! 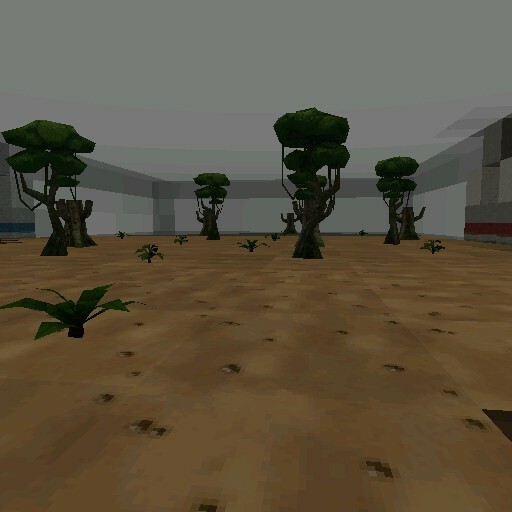 It’s definitely a hard map, as it has a lot of enemies that will chase you around (hint hint: maybe some dinos… and other things) and you’ll only get a few weapons, so you’ll have to use them carefully! If you want a challenge, this is the campaign for you! 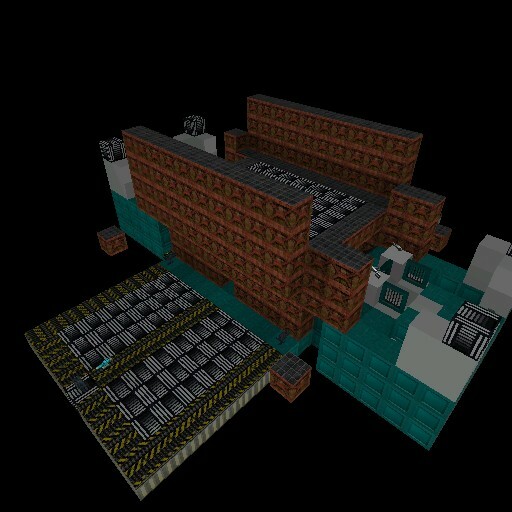 This is a map inspired on the TF2 “Turbine” map. Like the original, it’s a capture the flag one, and it has different areas that simulate the ones in the original map, and your team will get a nice variety of weapons. There are many halls and tunnels that you can explore here, so you might get lost, but that makes it more fun right? This map’s description says it’s a 1v1 map, but for a 1v1, it’s quite big! The design is pretty good too, as this creator has us used to. You get different weapons and powerups, and you might have to do some exploring to get these perks. We think that the map might work for small deathmatches as well, as the size allows it, and there are enough weapons for a few people. Do you like jumping around while fighting your friends? Then this map is for you! This map is basically a sort of island or platform in the middle of nothing, and there are jumppads all over this platform. You also get 4 blocks with no jumppads where you can try to land on, but it’s still quite tricky! This map might work better with small and medium groups, but big groups might find it challenging but fun anyway! As the name of the maps says, this map has “layers” or different levels. It’s basically like a box, with a big hole in the middle, and 3 different layers. You can find different weapons in each level as well so you might wanna check all levels out! We’ve seen a few maps like this, but they’re always quite fun so we’re sure you’re going to enjoy it!